The world of insects not only shocks us with its magnificent body color, freakish structures but also their alluring behavior which is currently regarded as one of the core research subjects as far as today’s robotics development is concerned. We recently observed a centipede’s walking style in a shimmy robot and how it has been possible to optimize a haphazard movement into a stable locomotion. 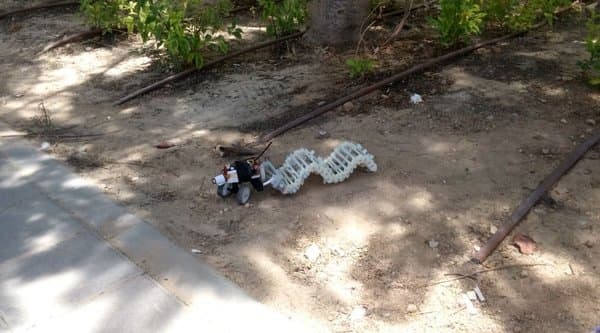 This time, we would concentrate on a sub-topic where the world’s first single actuator wave-like (SAW) robot has been engineered with the ideas and skills of a group of technology specialists from Ben-Gurion University of the Negev (BGU). It is a perfect venture, where robotics is ready to take a plunge into the industries and related machinery, with a flavor of Israeli desert. 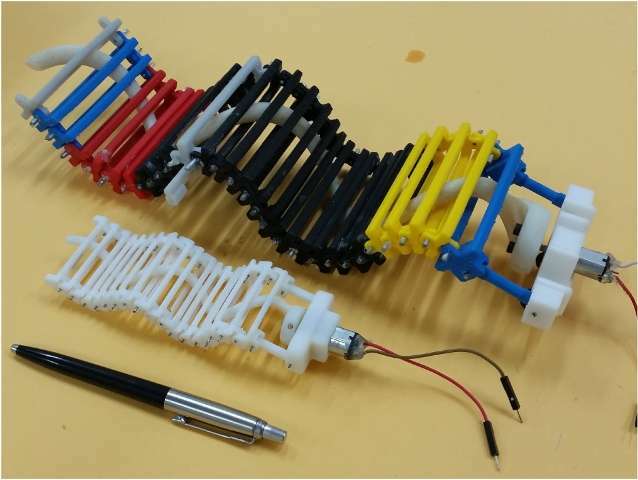 The customized “insect” is a 3D printed tiny wave-like creation that has a horizontal backbone-like structure coupled with a streak of vertical sticks. However, it does not possess an internal straight spine, making it more invertebrate. This sine-wave look-alike can climb over obstacles, crawl through uneven terrains including desert, grass and in fact water with ease, reaching a speed of 22.5 inches (57 centimeters) per second. SAW is a single motor propelled device that has been created to target several fields ranging from medical applications, maintenance, security operations and other jobs that require a flexible robot in terms of size. According to Dr. David Zarrouk, head of the Bio-Inspired and Medical Robotics Lab SAW provides that unique solution which makes it a polymath. It can be in charge of future imaging and biopsies of a man’s digestive system, also make an ace in propelling the surveillance systems. The robot is also offered in a waterproof variant that can swim 6 centimeters per second. With further addition of spiny traction enhancers to each link the robot can increase the speed up to 13% of its original offering. The University release confirms that SAW is no less than the BB-8 droid of Star-Wars when it comes to long distance traveling. Plus it boasts of an energy efficient design, robust outlines and a strong base that will help it, grab its zenith. To successfully replicate Zarrouk’s ideas, he partnered with two research associates, among whom one is specialized in the topic - swimming in viscous liquids and other in, movement on flexible and slippery surfaces to apply on a compatible robotic tool. The research report has been published in Bioinspiration & Biomimetics journal.